A worldwide campaign dedicated to promoting breast cancer education, the annual Breast Cancer Awareness Month is set to kick off this October. 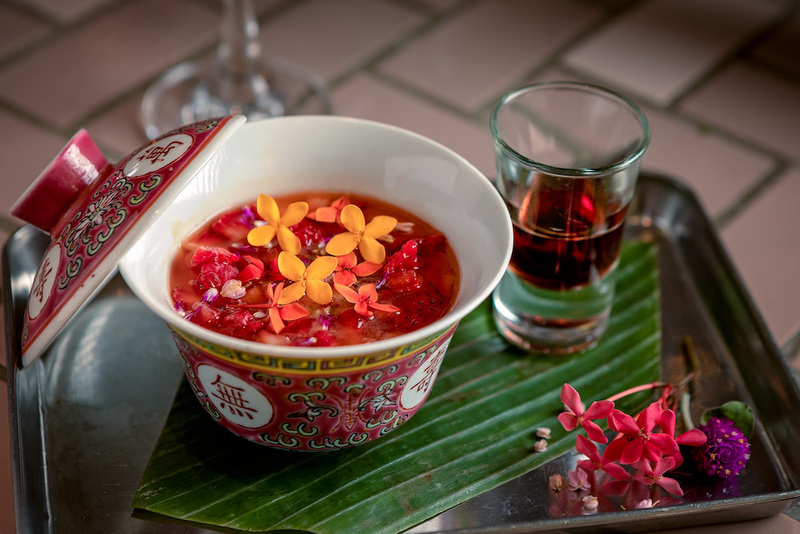 To support this momentous cause to combat the second leading cause of cancer death among women, Ming Fat House will launch a host of creative initiatives at its award-winning venues across Hong Kong. Modern Asian restaurant Mrs Pound and speakeasy cocktail bar Dr. Fern’s Gin Parlour will participate in fund-raising efforts for Breast Cancer Awareness Month, by unveiling a range of themed limited edition cocktails and hosting exclusive events. From 1-31 October, Mrs. 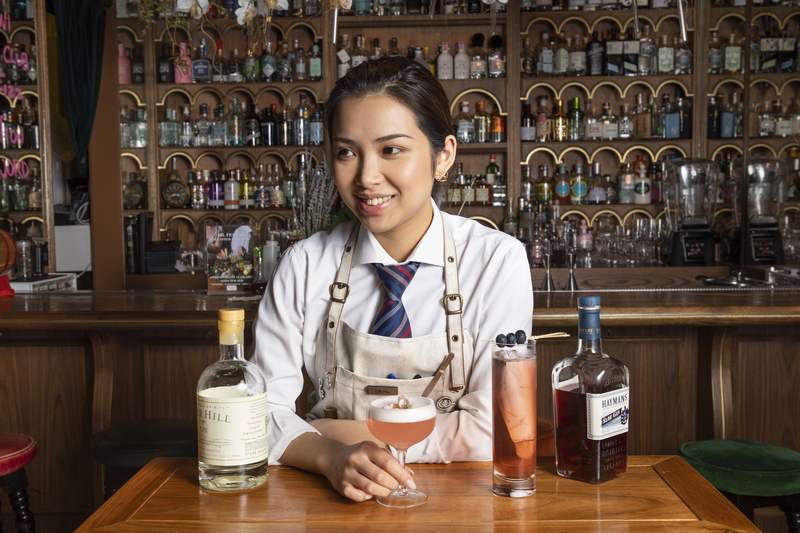 Pound will serve 2 exclusive cocktails in honour of Breast Cancer Awareness Month, with HK$5 from every cocktail sold going towards the Hong Kong Breast Cancer Foundation. The first drink, Gabrielle Chanel, is inspired by Mrs. Pound’s good friend, fashion icon and ultimate girl boss Gabrielle Bonheur Chanel. The woman who managed to create her own empire in a world ruled by men and change the course of fashion history, Coco Chanel also loved a good bubbly cocktail. “Gabrielle Chanel” is thus an ode to the legendary fashion diva, created with FAIR Vodka, pineapple juice, lime juice, Amaretto Disaronno and Prosecco, priced at HK$130. The second cocktail, The Vera Bride, is the epitome of modern elegance. Inspired by fashion icon and the Queen of Brides, Vera Wang is known for being different and bringing beauty into the world for every woman’s special day. Mrs. Pound’s most trusted confidante who shares her pastime for ice skating, Vera’s beautiful spirit is encapsulated in The Vera Bride. The cocktail is priced at HK$130 and consists of Citadelle Gin, rose liqueur, lemon juice, egg white and Kahlúa. On 13 October from 5-8pm, Mrs. 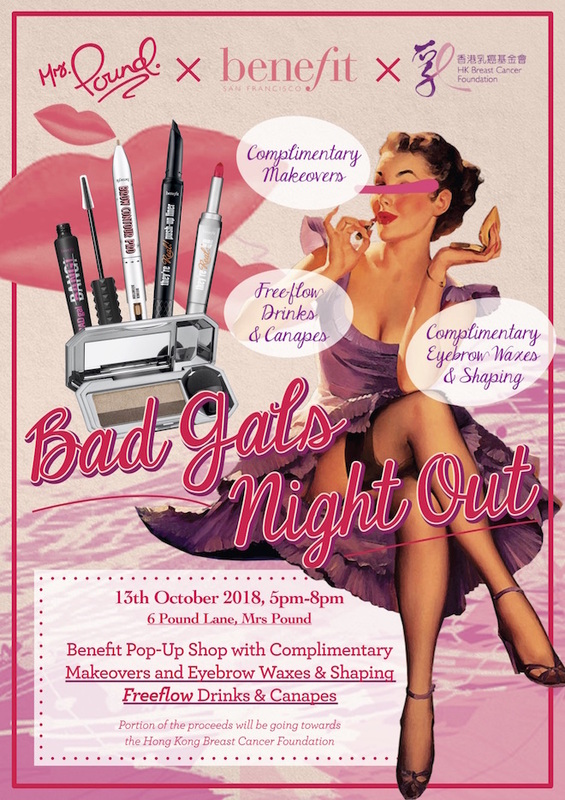 Pound joins forces with Benefit Cosmetics to invite all babes with a bad-itude to Bad Gals Night Out! Gather the dolls for an evening on Pound Lane with free flow cocktails, canapés, complimentary makeovers and brow waxes by the legendary Benefit Cosmetics team! Don’t forget to come dressed as your favourite woman icon (think Beyoncé, Audrey Hepburn, Hillary Clinton? ), as prizes will be given for various categories, including best dressed! In addition, the first 60 ladies who purchase tickets will receive a goodie bag filled with treats from Benefit! Tickets are priced at $350 per person and can be purchased either at Mrs. Pound or online at ticketflap.com/benefitxmrspound. A portion of ticket sale proceeds will go towards the Hong Kong Breast Cancer Foundation. Tucked away in the basement of the Landmark, Dr. Fern’s Gin Parlour is the place to receive a healthy prescription of G&T’s and other tasty libations– with a wide range available to cater to all ailments. From 1-31 October, Dr. Fern has designed two new prescriptions to contribute towards Breast Cancer Awareness Month, with HK$5 per prescription ordered donated to the Hong Kong Breast Cancer Foundation. The first is Dr. Her (HK$155), a prescription based on a true story about a woman named Elizabeth Blackwell, the first woman to receive a medical degree in the United States as well as the first woman on the UK Medical Register. 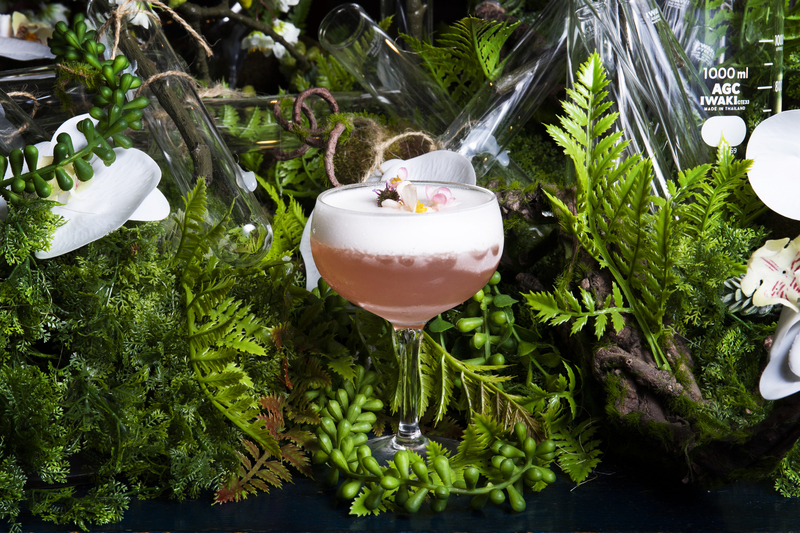 A social and moral reformer, as well as a pioneer in promoting the education of women in medicine, Elizabeth Blackwell’s prescription is a potent concoction of Barr Hill gin, rhubarb and rose syrup, lemon juice and egg white. The second prescription on offer is Hayman’s Three Women (HK$155), inspired by the three strong women in Christopher Hayman’s life: his mother Marjorie, his wife Karin and his daughter Miranda. Bringing together three generations of women that inspired the three copper pot stills which Hayman’s distillery uses is key in creating the subtlety of balanced, nuanced flavour long associated with the style of True English gin. Hayman’s Three Women is a mixture of Hayman’s Sloe Gin and Yuzu Tonic. On 20 October from 5-7pm, Head of Potions Dr. Paul will host a special Dr. Her Gin Masterclass at the Clinic, with a portion of proceeds from each ticket sale going towards the Hong Kong Breast Cancer Foundation. Dr Paul will guide patients through the history, botanicals and flavours of four unique gins that Dr Paul has personally handpicked. Dr Fern’s botanical garden will also be available for patients to garnish their own gins for remedial purposes. 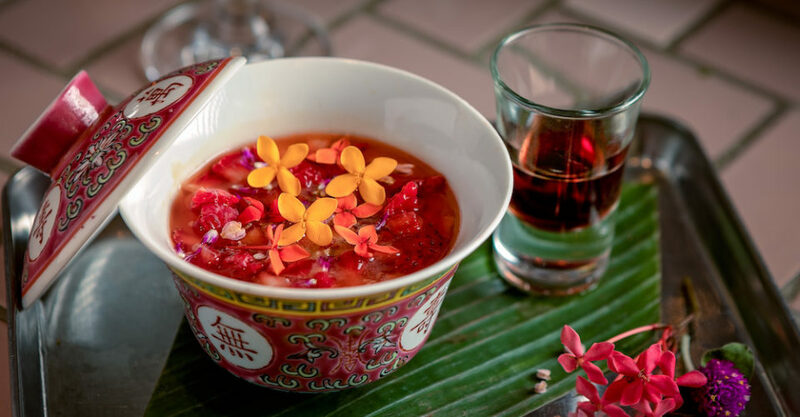 Guests can look forward to sampling Pinkster Gin, a special pink-hued gin distilled with five different botanicals before being steeped with delicious raspberries. Following the pink theme is BerryPickers Gin, a gin made with fresh strawberries harvested in Huelva, southwest Spain. Old Tom Hernö Gin is made from the same distilled gin as their London Dry but with a tweaked recipe, a higher dose of meadowsweet and a finish of honey. Elephant Sloe Gin boasts a classic dark hue derived from macerated sloe berries, which also add to its rich and juicy flavour profile. 15% of Elephant Gin’s profits also go to two leading elephant conservation foundations to support the preservation of wildlife. Tickets are available to purchase now at www.ticketflap.com/drhermasterclass. Early bird tickets (available until 20 September) are priced at HK$550 per patient, and regular tickets cost HK$600 per patient.